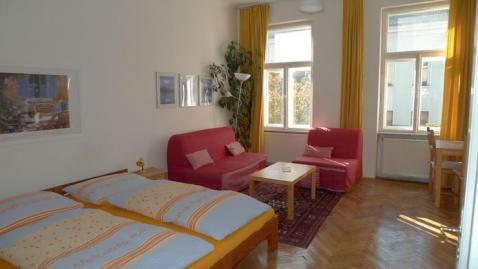 You live in a calm and bright one-room apartment, 40m�, with view on a tree in the 3.rd floor with elevator. The accommodation is comfortably furnished, equipped for 2 to 5 persons with double bed, and 2 sofa-beds, table, chairs, cable TV and internet, a comfortable cosy corner, and shower. The comfortably furnished kitchen with stove and refrigerator invites to self supply and cooking, if You like. All important implements such as table-ware, coffee machine etc. are present. There is a washing machine and an iron. Fresh bedlinen and towels are made available.